Life is full of ups and downs. There’ll be moments of unadulterated joy and times of heartache and despair. 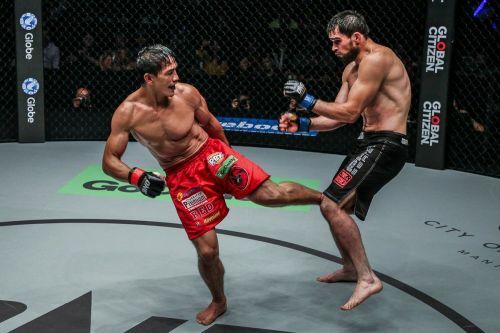 Eduard Folayang has ridden a roller coaster of emotions in his 15-year journey in martial arts. The Filipino has been at the top of the tree - more than once - and has crashed to earth with a thud. But like all champions, Folayang climbed his way back to the top of the mountain, and he’s enjoying the view. “It’s much more different now,” Folayang said of life as ONE Lightweight World Champion. Folayang’s life took a turn for the better about two and a half years ago. With the odds stacked against him, the Baguio City native overcame Japanese legend Shinya Aoki to claim the ONE Lightweight World Title in 2016. Folayang would defend it only once - beating Kiwi Ev Ting at ONE: KINGS OF DESTINY in Manila - before it was ripped from his grasp by Australian Martin Nguyen. Like Folayang, Nguyen was the overwhelming underdog, but left the Manila crowd stunned when he knocked out the hometown hero in the second round. Since that evening, Folayang has been desperate to make amends. He would win his next two bouts before landing a shot at redemption. With Singaporean knockout sensation Amir Khan standing in his way, Folayang repaid the faith of his adoring fans and reclaimed the lightweight World Title in a five-round affair back in November. Now “Landslide” feels rejuvenated, and he can barely walk the streets without being stopped by his fans. “It some ways I’m a lot more well known now, especially if I’m walking down the street,” Folayang said. Folayang’s stable, Team Lakay, is doing more than its bit to grow the sport in Manila. When the 34-year-old defeated Khan in front of his home fans at the Mall of Asia Arena in Manila, Folayang became the fourth Team Lakay World Champion in 2018, joining his teammates Kevin Belingon (bantamweight), Geje Eustaquio (flyweight) and Joshua Pacio (strawweight). In addition, he also became the first man to capture the ONE Lightweight World Title twice. Celebrating Landslide’s title-winning victory, Folayang’s Team Lakay brothers could not be happier for him. “I was able to be their with my teammates and they were able to give me great motivation to push through and get the belt again,” Folayang said. After both Pacio and Eustaquio unfortunately surrendered their belts early in 2019, Folayang is determined to successfully defend his crown on a historic card in Tokyo. He will headline ONE: A NEW ERA on 31 March when he defends his ONE Lightweight World Title against Japanese legend Shinya Aoki in a mouth-watering rematch. It’s perhaps the most significant bout in Folayang’s career, and one that he is currently fixated on winning. “I have to do everything that I can to win this next bout,” said Folayang. “I’m anticipating it to be the toughest of my career. Shinya has improved a lot, and it would not be smart to underestimate him. He is a legend after all.